Sophomore outside hitter and junior libero lead Owls to second place finish in Temple Invitational. For the first time in two years, the Owls’ women’s volleyball team has a .500 record through the first two games of the season. SAM OSHLAG TTN. 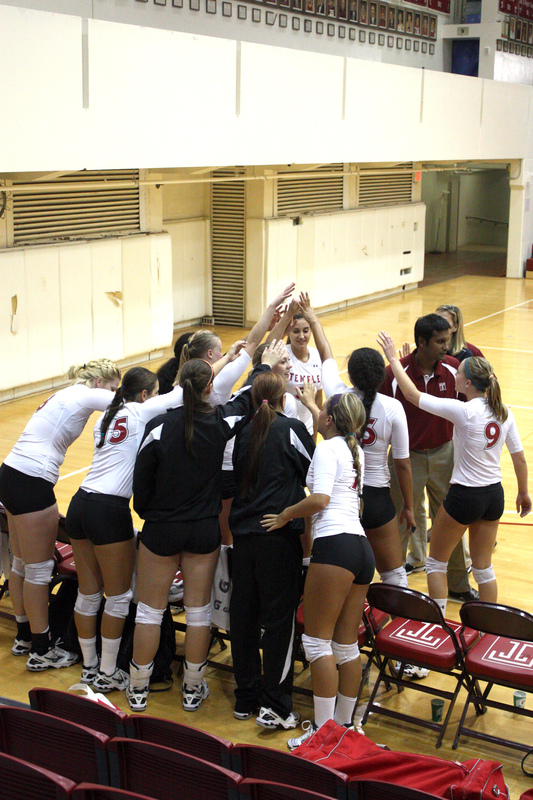 Coach Bakeer Ganes calls for a huddle at a game during the Temple Invitational this past weekend. Sophomore outside hitter Elyse Burkert led the Owls to a second place finish in the Temple Invitational throughout the weekend. The Owls (1-1) beat Stony Brook University in five sets on Friday, but fell to the tournament champions, South Carolina, 3-0. Due to Hurricane Irene, Temple didn’t face Montana as originally scheduled. 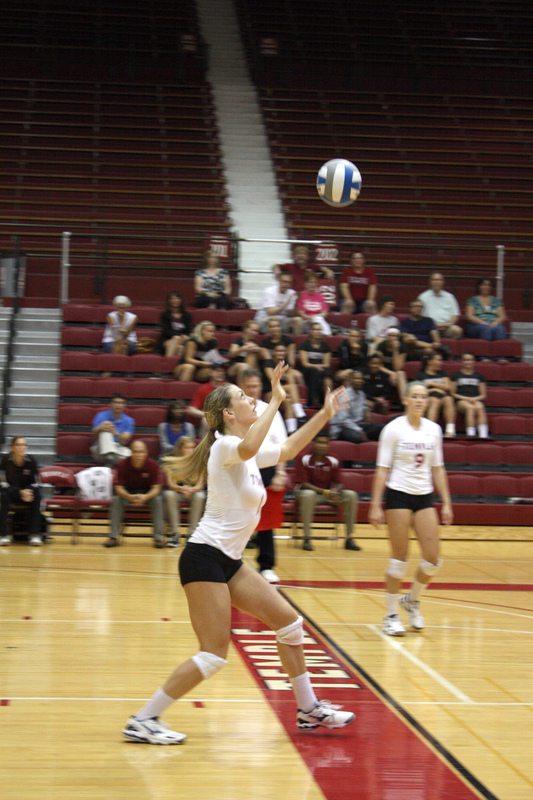 The Owls were led by their rising star, Burkert who tallied a team high 32 kills in the two games. Fellow sophomore outside hitter Gabrialla Matautia recorded two double-doubles over the weekend, totaling 23 kills and 25 digs. Junior libero Chelsea Tupuola recorded 39 digs on her way to winning Most Valuable Libero for the tournament. The Owls opened the tournament with a close victory over the Seawolves, giving Ganes his first career win as head coach. The Owls went up quickly on Stony Brook, taking the first two sets easily. But the Seawolves fought back, behind senior outside hitter Alicia Nelson’s 18 kills and 21 digs, to win the next two sets. A close fifth set reached 13-13 before Stony Brook took the lead with game point on three separate occasions. Temple fought off all three deficits before walking away with an 18-16 victory in the fifth set. The Owls then faced the Gamecocks (3-0) in the de facto tournament championship match, where the more experienced Southeast Conference team won in three straight sets. Led by sophomore outside hitter Juliette Thevenin’s 10 kills and 19 digs, South Carolina outplayed the Owls in virtually almost every category. Thevenin was named the tournament’s Most Valuable Player. Temple fought throughout the match, giving the team the confidence that they can compete with anyone. “I think it’s definitely putting us in a positive direction from last year,” freshman setter Tiffany Connatser said. The discussion of the Owls’ 2011 season will certainly revolve around the “youth movement” the team is experiencing. Led by rookie coach Ganes, Temple returns only three seniors. The freshman and sophomore classes have already provided a big impact just two games in and will continue to do so for the foreseeable future. The 2011 Owls are looking to rebound after a disappointing season last year, when they won just four games on their way to a ninth-place finish in the A-10. And the man behind the turnaround is the demanding Ganes. “He’s helped me so much, giving me a lot of confidence, building me up and helping me a lot as a freshman trying to run the team,” Connatser added. Ganes’ biggest challenge will be building chemistry on a very young and very inexperienced Temple team, starting with Connatser. The Owls plan to gel quickly and they hope this weekend’s games pushed them in the right direction. “We just have to talk a lot, communicate and really work together and support each other all the time in order for us to be good because we are new and we don’t have anything established,” Burkert said. “We want to get competitive as fast as possible, and I think we’re on the right track,” Ganes added. The Owls take the court again next weekend in the Big Five Tournament, hosted at the Palestra at the University of Pennsylvania.